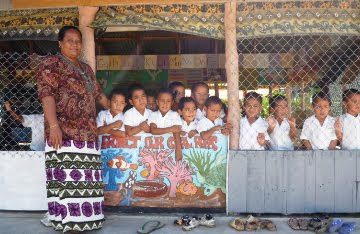 We are proud to be a part of the rebuilding of The Satitoa Village Preschool. Satitoa is located on the south-eastern tip of Upolu Samoa, and was one of the worst hit areas in the Tsunami. The Satitoa Village Preschool was the educational and social home to around 30 children and their families until it was completely destroyed in the September 29th disaster. Pictured: Happy days to devastation. Before and after shots of the Satitoa Village Preschool. Photos: Tuputupu-A ‘E Education Trust. The new building site is approx 1km inland from it’s original beachfront location. In a similar style to it’s predecessor, the new preschool will be a two roomed school building with a 10 x 10m square footprint. The building will have a concrete floor and plywood exterior. The main classroom will be open plan with louver windows for ventilation. The second room will house toilet and washing facilities, plus storage for classroom resources. This project is a huge team effort; the infrastructure is managed by the Tuputupu-A ‘E Education Trust, with plans and quantity take offs being completed by John Pullar in Whakatane. The site preparation and groundwork will be in place before we arrive. We hope to get the project to a ‘closed in stage’ and ready to hand it over to the next group of volunteers by the time we leave.